To work at all, the nervous system needs its cells, or neurons, to connect and converse in a language of electrical impulses and chemical neurotransmitters. For the brain to be able to learn and adapt, it needs the connections, called synapses, to be able to strengthen or weaken. A new study by neuroscientists at MIT’s Picower Institute for Learning and Memory helps to explain why strong synapses are stronger, and how they get that way. By pinpointing the properties of synaptic strength and how they develop, the study could help scientists better understand how synapses might be made weaker or stronger. Deficiencies in synaptic development and change, or plasticity, have a role in many brain diseases such as autism or intellectual disability, says senior author Troy Littleton, the Menicon Professor of Neuroscience in MIT’s Department of Biology. “The importance of our study is figuring out what are the molecular features of really strong synapses versus their weaker neighbors and how can we think about ways to convert really weak synapses to stronger ones,” Littleton says. In the study, published in eLife, Littleton’s team used innovative imaging techniques in the model organism of the fruitfly Drosophila to focus on “active zones,” which are fundamental components of synapses. The scientists identified specific characteristics associated with a strong connection on both sides of the synapse. The team, led by postdoc Yulia Akbergenova and graduate student Karen Cunningham, also studied how strong synapses and active zones grow, showing that those that have the longest to mature during a few critical days of development become the strongest. The team’s study began with a survey of active zones at a junction where a motor neuron links up a muscle. About 300 active zones were present at the neuromuscular junction, which gave the team a rich diversity of synapses to examine. Across many flies, the team consistently found that only about 10 percent of the active zones at the junction were strong, as measured by a high likelihood that they would release the neurostransmitter glutamate when the presynaptic neuron was stimulated. About 70 percent of the active zones were much weaker, barely ever releasing glutamate given the same stimulation. Another 20 percent were inactive. The strongest active zones had release probabilities as much as 50 times greater than weak ones. The team ran several tests. In one experiment, for instance, they showed that it’s not their supply of synaptic vesicles, the containers that hold their cache of glutamate. When they stimulated the presynaptic neurons over and over, the strong ones retained their comparatively higher likelihood of release, even as their synaptic vesicle supply was intermixed with those from nearby active zones. The presynaptic tests that showed a difference had to do with measuring the rate of calcium influx into the active zone and the number of channels through which that calcium reaches the active zone. Calcium ions stimulate the vesicles to fuse to the membrane of the presynaptic cell, allowing neurotransmitters to be released. At strong synapses, active zones had a significantly greater influx of calcium ions through a notably higher abundance of calcium ion channels than weak synapse active zones did. Stronger active zones also had more of a protein called Bruchpilot that helps to cluster calcium channels at synapses. Meanwhile, on the postsynaptic side, when the scientists measured the presence and distribution of glutamate receptor subtypes they found a dramatic difference at strong synapses. In the typical weak synapse, GluRIIA and GluRIIB containing receptors were pretty much mixed together. But in strong synapses, the A subtype, which is more sensitive, crowded into the center while B was pushed out to the periphery, as if to maximize the receiving cell’s ability to pick up that robust signal. With evidence of what makes strong synapses strong, the scientists then sought to determine how they get that way and why there aren’t more of them. To do that, they studied each active zone from the beginning of development to several days afterward. “This is the first time people have been able to follow a single active zone over many days of development from the time it is born in the early larvae through its maturation as the animal grows,” Littleton says. They did this “intravital imaging” by briefly anesthetizing the larvae every day to check for changes in the active zones. 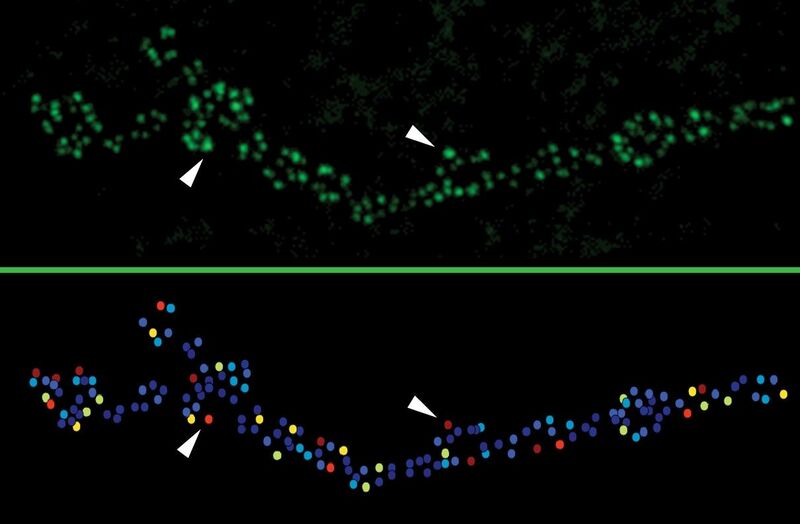 Using engineered GluRIIA and GluRIIB receptor proteins that glow different colors they could tell when a strong synapse had formed by the characteristic concentration of A and marginalization of B. One phenomenon they noticed was that active zone formation accelerated with each passing day of development. This turned out to be important because their main finding was that synapse strength was related to active zone age. As synapses matured over several days, they accumulated more calcium channels and BRP, meaning that they became stronger with maturity, but only a few had the chance to do it for several days. The researchers also wanted to know whether activity affected the rate of maturation, as would be expected in a nervous system that must be responsive to an animal’s experience. By tinkering with different genes that modulate the degree of neuronal firing, they found that active zones indeed matured faster with more activity and slower when activity was reduced. In addition to Littleton, Akbergenova, and Cunningham, the paper’s other authors are MIT postdoc Shirley Weiss-Sharabi and former MIT postdoc Yao Zhang. The National Institutes of Health supported the research.